Monitor network hosts, shared resources, traffic, get MAC addresses, scan TCP and UDP ports, and be notified when devices turn on or go down. Create network diagram and see your network's state in visual form at any time. 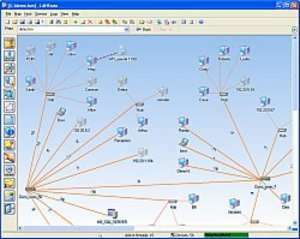 LANState contains many tools for administrators and users such as sending messages, shutting down and turning on remote computers, ping, name lookup, trace route, obtaining information on remote hosts, creating reports, etc. For security reasons, you should also check out the 10-Strike LANState download at LO4D.com which includes virus and malware tests. Additional screenshots of this application download may be available, too.